Under the sunny skies of an 85 degree summer day, the underground pump at the end of Lyman Avenue in Mantoloking revs to a vibrating roar rising from the nearby sewer grate. A few feet away, a steady stream of water trickling from an outfall pipe into Barnegat Bay whooshes to a swift current and shoots out feet into the waterway. The pump is doing its job – removing water from the storm sewer system – but there’s no storm and no flooding on the highway. The water is fresh groundwater that has seeped into the system. The scene repeats itself all day and all night long, prompting worry from local residents and environmentalists that a system designed for occasional use is continuously pumping runoff into an already fragile bay ecosystem. The system is designed to kick on only when flood levels reach those seen in a 25-year storm. There are several theories on how the groundwater is intruding into the pump system, ranging from the use of ductile iron pipes to what sources have described as a physical connection between the new pumping system and the previously-existing storm sewer system during the reconstruction of Route 35. Now, state officials are scrambling to apply seals to 12 miles of piping before the highway project is completed in October. “We are continuously making tweaks and adjustments to the system to ensure the pumps are set to correctly respond to appropriate water levels,” said Kevin Israel, spokesman for the New Jersey Department of Transportation, the state agency responsible for the highway reconstruction project. [box type=”shadow” align=”” class=”” width=””]Where Are the Pumps? Berkeley: One pump station at Bayview and 22nd avenues. Seaside Park: Three pump stations at Bayview and 8th avenues, Bayview and Island avenues, and on L Street. Toms River: One pump station on Eisenhower Avenue. Mantoloking: Two pump stations on Lyman Street and on Downer Avenue. Local officials have occasionally – though, often quietly – complained during the past two years the highway project has been underway about a lack of communication between the DOT and local communities, and the agency’s perceived lack of interest in responding to local concerns. At one point, Lavallette officials openly battled with the DOT over the construction schedule in its business district, and a Seaside Park council member pleaded with the Ocean County freeholder board to intervene in order to improve communication between the agency and her town. “Public Works officials and town council people were calling [the pump system] into question from the very outset,” said Wenzel, a former Lavallette council member. Wenzel’s group, as well as the New Jersey chapter of the Sierra Club, have also hinted that the matter may have been avoided had the state prepared an environmental impact statement before the project started. The DOT did not go through that process due to exemptions related to the state’s recovery from Superstorm Sandy. 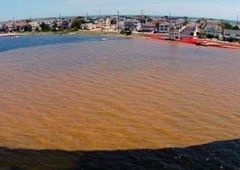 The controversy over the continuously running pumps reached a tipping point over the summer when a brown silt plume appeared in Barnegat Bay off the 8th Street pump station in Seaside Park. Water testing performed after the plume appeared yielded negative results for bacteria and other contaminants, but brought the malfunctioning pumps into the public eye. Israel said work to seal the pumps will go on through the entire fall as the highway project is completed. Meanwhile, the pumps will continue operating. “We have set the pumps to only operate when the water reaches a higher level, this will temporarily reduce the frequency of their operation until we have completely sealed the system,” Israel said. Meanwhile, a plan to install a concrete “rip rap” floor on the bay where the Seaside Park pump empties, in order to avoid another disturbance of the bay bottom which led to the summer silt plume, has been abandoned. “Rip-rap was an option being considered but, at the advice of the Army Corps of Engineers, will not be installed in favor of allowing the tides to naturally deposit silt on the bay floor,” Israel said. Wenzel said her group, and local officials, are worried that when the highway project is completed this fall, the incentive to continue work on the pump system may wane. She suggests the state should fully investigate the matter and potentially hold back bonds put up by the contractors who designed or built the system. “Somebody needs to be held accountable, and there needs to be a good look into when people knew there was a problem,” Wenzel said. Further, Save Barnegat Bay says state officials are basing the idea that the groundwater from pumps is not contaminated on the group’s own testing it performed this summer. But the testing was only performed once in the wake of the silt plume, and any substance that finds its way into the sewer system could potentially end up in the bay without anyone knowing, since water testing is not being performed on a daily basis. 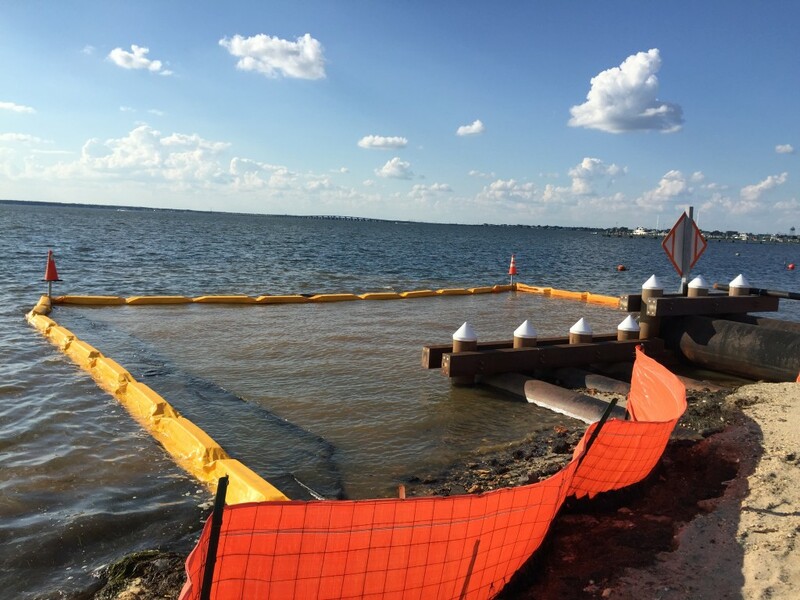 The DOT, for its part, has said the new drainage system includes 76 manufactured treatment devices, or MTDs, that separate trash, oils, and sediment out of the water before it flows to the bay, effectively purifying the water. It is the first time runoff into the bay will be filtered and cleaned, improving the quality of water discharged into the bay – previously, stormwater simply ran from the highway into the waterway. Save Barnegat Bay is calling on the DOT to hold meetings in Ocean County to address the concerns of residents and officials, though no such meeting is currently scheduled. “The DOT needs to come down here and give the locals a chance to put on the record what their concerns are before the work is finished,” Wenzel said.